Apple's iPhone 4.0 preview on Thursday came with a buried surprise in the developer agreement. If they want to make software for the iPhone 4.0, developers must use only Apple's proprietary tools, which could spell doom for Adobe's upcoming Flash CS5 software that will compile iPhone-compatible apps. The paragraph in question in the new Apple developer agreement, first noticed by John Gruber of the Daring Fireball blog, says that the Cupertino company will not approve apps into the App Store unless they are built using its proprietary software. Basically, this would mean that apps built with third-party compilers, such as Adobe's upcoming Flash-to-iPhone compiler, would not be accepted into the App Store. The new rules are a direct blow to Adobe's Flash CS5, which is due release next week on April 12. The iPhone app compiler in Flash CS5 is flagged as a landmark feature in the new software. In its iPhone 4.0 preview on Thursday, Apple CEO Steve Jobs didn't mention anything about the new rule in the developer agreement. When asked in a Q&A session after the event whether he changed his position on Flash and Java, he simply said "No." Jobs has reportedly iterated his dislike of Adobe's Flash platform with several occasions, calling it "buggy" and a "dying technology". Despite Apple's Flash roadblock ahead, Adobe told Wired: "We are aware of the new SDK language and are looking into it." 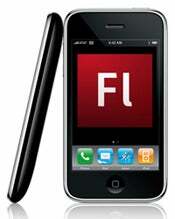 The company said it would continue to develop the Flash CS5 iPhone OS packager. Apple has made no statement regarding the developer agreement changes. The new developers' agreement rules will probably further the divide between Apple and Adobe. Apple notoriously doesn't allow videos encoded in Flash to play on its devices based on the iPhone OS, such as iPod Touch, iPhone, and iPad, ignoring the fact that an overwhelming majority of videos on the Web use this technology in ads, multimedia content, and browser-based games.